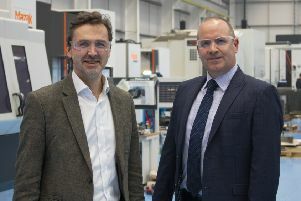 An Ellon-based engine pump manufacturing specialist has secured long-term contracts and is working on new product collaborations with several leading diesel engine manufacturers. Representatives from LFH Engineering visited China to develop relationships with existing customers and work together on custom-built pump designs which will meet the specific needs of the Far East manufacturers. CEO Les Hill and his colleagues also delivered technical training to local staff on LFH Engineering’s bespoke high-quality diesel engine coolant pumps, including precise fitting and maintenance. Since 2013, LFH Engineering has worked with Hudong Heavy Machinery in Shanghai, the market leader in marine power equipment in China for low and medium speed diesel engines and power system integration. The company is also collaborating with Shaanxi Diesel, a global marine diesel engine and diesel generator spare parts supplier. LFH Engineering has also successfully supplied Weichai, one of the largest automobile and equipment manufacturing groups in China, with diesel engine coolant pumps for its powertrain engines. The China visit was seen as a long-term investment for Mr Hill, who travelled across the country with his local distributor. Mr Hill said: “We have a distributor in China, but business in the Far East is very much based on personal relationships, so it was important to spend time with our customers to build on our existing relationships. This is something we will continue to do throughout the year. “We also anticipate that the clients will visit our facilities in Ellon, to experience first-hand how our pumps are manufactured. “The pumps we are working on are highly technical and it takes a number of years to develop and test a prototype that will meet the demands of our Chinese customers. “It was extremely beneficial to meet with them and discuss their requirements face to face.